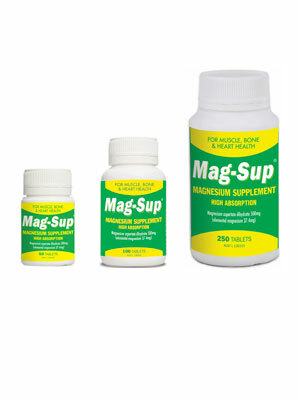 Mag-Sup is a high potency magnesium supplement for use in magnesium deficiencies. Magnesium is an essential mineral important for normal function of nerves, muscles, bones and heart. Each tablet of Mag-Sup contains magnesium aspartate 500mg per tablet equivalent to 37.4 mg elemental magnesium. It provides a high level of elemental magnesium per tablet and delivers it in an easily absorbable format. Mag-Sup tablets are equivalent to MagMin (Reg TM distributed by Blackmores Ltd). Dosage: Adults & Children over 12 years: Take 2 to 6 tablets daily with meals or as advised by your health professional. Children 6 - 12 years: Take 1 to 3 tablets daily with meals or as advised by your health professional. Children under 6 years: as advised by your health professional. Mag-Sup contains no added sugar, lactose, gluten, salt, preservative, artificial colourings or flavourings and is available in bottles of 50's, 100's and 250's. Store below 25°C. Mag-Sup is made in Australia.